The Launch Place received 99 applications for the 6th Annual IdeaFest Pitch Competition from various start-up companies located in the US and abroad. The top 20 competitors took the stage to present their innovative business ideas in the River District of Danville, VA today. The competition kicked off at 1:00pm, with a keynote speech from Sanjay Patel, Founder & CEO of TiO, a portfolio company of The Launch Place. Short for “Turn it On,” TiO is the only smart home system designed with builders in mind. TiO creates simple hardware and software products that allow for wireless control of the home through various mediums: a single app on a homeowner’s phone or tablet, wall touch switches and through voice control. TiO was selected as a Sound & Vision magazine “Top Pick” in 2016 and a 2017 Consumer Technology Association Mark of Excellence winner. Winner of this year’s competition was Pocket Protector who was awarded a $5,000 cash prize. Pocket Protector is a medical device company aiming to prevent pocket hematomas (the buildup of blood) after pacemaker implantation. The product is a simple device that applies even pressure to the “pocket” of a patient after pacemaker implantation. The applied pressure to the region prevents blood from pooling into the pocket through the muscular fascia or blood vessels. Second place and a $3,000 cash award went to NIRSleep. NIRSleep is developing a more accurate and native method to measure sleep to enable better patient outcomes. 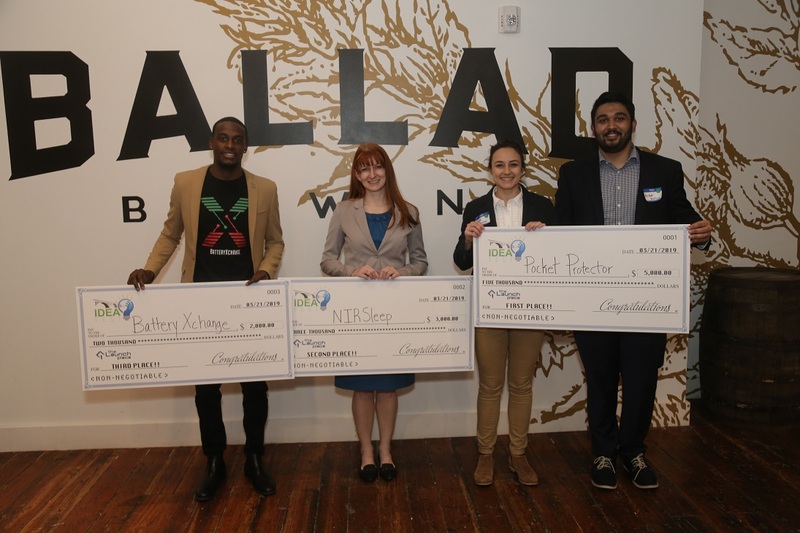 Battery Xchange took home third place with a $2,000 cash prize. Battery Xchange is a rental platform that provides portable batteries to cell phone users on-the-go. Check out all the pitches on The Launch Place's Facebook Page. Winners of the competition will also be eligible to receive twenty-five hours of free business consulting from The Launch Place. The Launch Place, located in the River District of Danville, assists with business formation, job creation and retention through its business consulting services and investment funding, while having a dual responsibility to recruit and retain entrepreneurs to the Dan River Region. The IdeaFest competition exposes The Launch Place’s services and funds to start-up companies that are ready to launch, or are seeking early stage capital. The Launch Place could potentially invest in the company from its Seed and Pre-Seed Funds that were established from a grant awarded by the Danville Region Foundation.